Engaging young people in strategies that help increase the number of people involved in the youth tutor/mentor program movement, using ideas and strategies launched on the Tutor/Mentor Connection and Tutor/Mentor Institute, LLC web sites is the goal of this strategy. This link points to the first of our pages of visualizations done by interns working with us since 2005. If we can engage more youth, from schools, non profit, faith groups, etc. 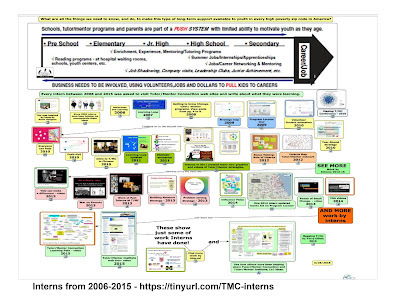 in creating similar visualizations we can increase the number of people looking at these ideas and applying them in actions that help tutor/mentor programs grow in more places. Imagine if hundreds of people throughout the world were creating and sharing their own interpretations of these ideas. Here's a page on a #sketch50 site that shows something like this happening. Imagine if all of these graphics were focused on single ideas in the Tutor/Mentor blog library. Since this is a public awareness building strategy, a page has been created here, to outline this concept.